how your beauty touches the world. It's time for women to have a new bedtime story; one that tucks them into bed with a warm sense of wholeness and self compassion. This fully illustrated color hardback picture book starts with a story that inspires women to see their most beautiful reflection. A guided journal follows empowering each reader to explore layers of the question, “What makes me beautiful?” and to hear her own answer, feel the beauty within her, and know how her beauty touches the world. A meaningful gift just for you and the women in your life. Is this a gift? You may include a personal message in Note to Seller on the payment screen. You may also request an autographed copy in the Note to Seller on the payment screen. private Knowing Beautiful Half Day Retreat! "As you read Amy Tirion's Knowing Beautiful you will feel guided into knowing and ackno﻿wledging yourself in a deeply soulful way. Tirion's gentle wisdom goes to the heart of being a woman." "Knowing Beautiful invites a woman to see and joyfully manifest her own unique strengths and beauty. An inspiring gift for mothers and daughters!" 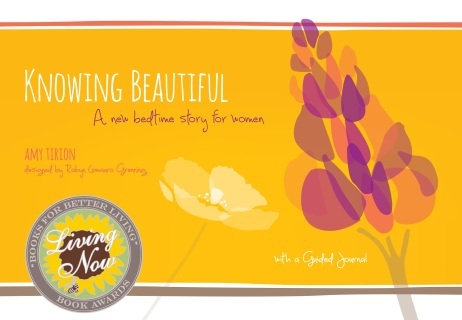 "Through Knowing Beautiful, author Amy Tirion gently unlayers a profound message to women to relish our nature as we return again and again to recognize the preciousness and enormity of what lies deep within. Amy's heartful wisdom invites us to experience our own softening hearts, to befriend ourselves and discover the unparalleled power of self-compassion." "I love this book. I would come back to the journal again and again. It makes me feel grounded and inspired at the same time!" – Shasta Nelson M.Div, CEO of www.GirlFriendCircles.com and author of Friendships Don't Just Happen! "Elizabeth Arden, a pioneer thinker once said, “The most beautiful woman is the woman who is most completely herself.” Not only does Amy embody this principle, but now with the introduction of Knowing Beautiful she is giving all women the opportunity to discover the beautiful that is alive in each of us. May you grow wiser and more beautiful each day with this book by your side"
Amy Tirion talks about what makes a woman beautiful in Elizabeth Arden's mini-documentary series ~ Her Story. Selected as one of fourteen inspiring women nationwide, Amy shares her views on beauty and her work to empower women through her Delight for the Soul programs.